It’s taken an age but Olushola Ajose, A.K.A Afrikan Boy, has now arrived on our doorsteps with a sharp, edgy, brilliant and witty album that’s crept into our lives like all great pieces of audio usually do if we’re patient enough to hang around and wait. Afrikan Boy first came to our attention nearly a decade ago with his catchy, clever song about stealing goods and getting caught stealing goods from those great British bastions of shopping stores, Asda and Lidl. What we have on this album is a more mature Afrikan Boy. He’s nine years older, a 25 year old and not the teenager he was when we first met him but that hasn’t taken away the humour and, indeed, the sharpness of his lyrics that make this man unique and in a position to be adored by the nation outside his front door in south east London. In July, we wandered down a long east London street to witness a trio of men turn a polite English garden party into a hands in the air rave in a short but very impressive half hour set. Picnic blankets were kicked away and children who earlier were being forced by their pushy parents to dance and jump around were joining in with the adults around them in scenes not witnessed since we saw Dizzy Rascal dropping Bonkers in a big field in Somerset. Speaking of which, we also saw Afrikan Boy on a stage in Somerset earlier this year with M.I.A who he donated those fantastic vocals to on the Paper Planes remix that some of us have been dancing to for a few years now. If his collaboration with DJ Shadow (I’m Excited) wetted the appetite for trying to investigate this voice with humorous overtones and snappy sound bites then The ABCD is an album that some of us who have been waiting patiently for a while now are not disappointed by. From the opening track (and name of label) YAM (Young Ambitious, Motivated) past the excellent single Hit ‘Em Up that samples the 60s Nigerian Afrobeat hero Fela Kuti’s Wa Dele Wa Royin and right through tunes about losing visas and reminding us how to spell his name (spell it with a ‘K’) this album has no low points but a voice that comes with a permanent smile that you’ll fall for during the first listen and will put a massive smile on your own face too. An album he has put his heart and soul into but not the song about supermarket security guards although he does tease us with a mention of this on Spell It With A K” which basically is a song about that song. Some things in life really are worth waiting patiently for. Get a free download of “Lidl” from Afrikan Boy’s Tumblr. Hit ‘Em Up can be watched on YouTube. 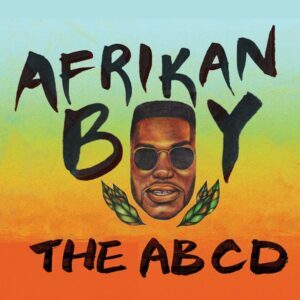 Afrikan Boy – The ABCD is available from here (digital) or via Afrikan’s website: afrikanboy.com. There’s also a free Afrikan Boy gig on this Facebook page and you can also find Afrikan Boy on Twitter as @AfrikanBoy.